We just concluded meteorological winter (Dec-Feb) in Minnesota and a few comments on the prevalent weather patterns are in order. Enhanced by the warmest December in history the meteorological winter finished as the 6th warmest of all-time in Minnesota dating back to 1895. The average temperature for the three months was about 13°F warmer than normal. Only 1930-1931, 1986-1987, 1997-1998, 2001-2002, and 2011-2012 were warmer. Extremes for the winter season ranged from 65°F at Browns Valley (Traverse County) on February 27th to -36°F at Cotton and Embarrass (both in St Louis County) during the month of February. The warmth this winter was due mostly to unusually warm nights rather than unusually warm days. Total precipitation for meteorological winter ranked as the 13th wettest in state history. Many places reported over 4 inches of precipitation, much of it coming as rain rather than snow. Except for the north shore areas and some portions of southwestern Minnesota, most observers reported less than average snowfall. A few places along the north shore of Lake Superior reported over 50 inches. Another unusual feature of meteorological winter (Dec-Feb) was the lack of sunshine. 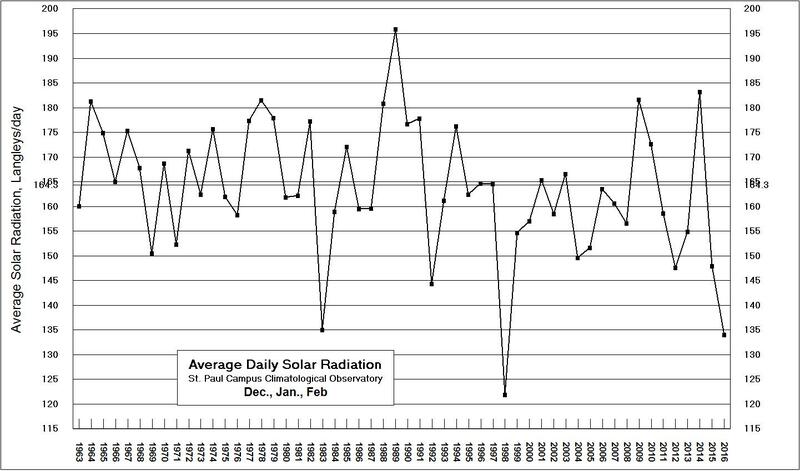 According to Dave Ruschy who keeps the solar radiation records from the St Paul Campus Climatological Observatory, this winter had the 2nd lowest amount of sunshine of all winters since the winter of 1962-1963. Only the winter of 1997-1998 had less sunshine or solar energy. Many citizens have remarked that although the winter was mild, it was mostly gloomy! 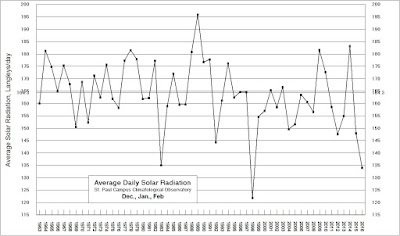 Here is the chart for solar average daily solar radiation for the winter months (Dec-Feb) on the St Paul Campus from 1962 to 2016. A fast moving snow storm brought a few inches of snow to many southern Minnesota counties on Monday night and into Tuesday morning (Feb 29th-Mar 1st). Several climate stations reported from 1 to 3 inches of new snow, and for some a daily record amount occurred including: 4.5" at Sioux Falls, SD; 3.2" at Lakefield; 5.0" at Luverne; and 4.0" at Pipestone. A cold air mass ushered in sub zero temperatures in many northern Minnesota communities for March 1st. Though not record-setting some of the coldest readings on March 1st included -17°F at International Falls, -18°F at Kabetogama, -19°F at Tower and Cotton, and -20°F at Crane Lake. The Crane Lake reading was the coldest temperature in the nation for March 1st, a distinction Minnesota has not been recognized for in recent years during March. In addition some northern communities reported daytime high temperatures that only made it to the single digits above zero F on March 1st. The cold start to March will give way to a period of warmer than normal temperatures starting this weekend and lasting well past mid-March. So much of the state's snow cover and soil frost will be lost by the third week of the month. A recent paper from NASA scientists published in Journal of Geophysical Research offers an analysis of the long-lived Eastern Mediterranean drought which has worsened in recent years. Their analysis shows that it may be the worst drought in that geographic region in over 900 years. This drought continues to affect portions of Israel, Jordan, Syria, and Turkey. The United Kingdom Met Office announced this week that the winter of 2015-2015 (Dec-Feb) was the warmest of record dating back to 1910 for England and Wales. Some of the text from their press release includes: "The latest end of month statistics show it was provisionally the warmest winter for England and Wales since the record series began in 1910, while it was the third-warmest for the UK as a whole. The warmth has been most notable in the south of the UK with mean temperatures across much of the area more than 2°C above average......In the Central England Temperature record series, the longest temperature record in the world dating back to 1659, this winter has been the second-warmest at 6.7C, just behind the previous record of 6.8C set 1869." Climate.gov this week featured a reference to a new tool used for climate adaptation planning. It is called AdaptWest and provides a spatial database to help plan for resilience strategies relative to a changing climate and also promotes conservation practices relative the natural resources. I have read your book which includes accounts of some remarkable March blizzards. Are the maximum snow depths of winter historically associated with the month of March as well? Yes to a degree you are correct. Examining the maximum snow depth values for all winters in Minnesota, 43 percent of them have occurred in the month of March; 32 percent have occurred in February; and 19 percent have occurred in January. The other 6 percent of historical maximum snow depth values have occurred in December or April. This pattern is not likely to prevail this year, as most of our climate stations in Minnesota have reported maximum snow depths in February so far and already lost a good deal of snow cover to periodic warm days. The average MSP high temperature for this date is 35 degrees F (plus or minus 11 degrees F standard deviation), while the average low is 20 degrees F (plus or minus 12 degrees F standard deviation). MSP weather records for this date include: highest daily maximum temperature of 61 degrees F in 1983 and 2000; lowest daily maximum temperature of 8 degrees F in 1917: lowest daily minimum temperature is -22 degrees F in 1873; highest daily minimum temperature of 50°F in 1894; record precipitation of 0.80 inches 1984; and record snowfall of 9.6 inches also in 1984. Average dew point for March 4th is 16 degrees F, with a maximum of 53 degrees F in 1983 and a minimum of -17 degrees F in 1978. The state record high temperature for this date is 70 degrees F at Currie (Murray County) in 1905 and at Luverne (Rock County) in 2000. The state record low temperature for this date is -43 degrees F at Bagley (Clearwater County) in 1917. State record precipitation for this date is 3.54 inches at Isabella (Lake County) in 1966; and record snowfall is 26.0 inches also at Isabella in 1966. By far the coldest March 4th in state history was in 1917. With abundant snow on the ground an Arctic air mass brought record-setting low temperatures to all parts of the state. At least 24 climate stations reported morning lows of -30°F or colder. The temperature never rose above 0F that day at Sandy Lake Dam (Aitkin County). Fifty years ago this week, over March 2-5, 1966 one of the worst blizzards of the 20th Century struck the eastern Dakotas and much of Minnesota, dropping record-setting amounts of snow and shutting down schools and businesses for days. Itasca State Park, Park Rapids, and Isabella reported over 30 inches of snowfall, and at least 22 other communities reported over 20 inches. Snow drifts up to 30 feet high were observed in some areas of the Red River Valley, where snowmobiles were used to rescue drivers from abandoned vehicles on the highways. Snow depths in northeastern Minnesota exceeded 50 inches. The Duluth Office of the National Weather Service has posted a good retrospective of this storm. Yet another strong blizzard which brought winds ranging from 40 o over 70 mph struck Minnesota over March 3-4, 1985. Many areas of the state received over a foot of snow, while some observers reported over 20 inches including Morris, Two Harbors, Olivia, Wadena, Brainerd, Hastings, Cloquet, and Moose Lake. Schools and businesses were closed, as were several highways and interstates. Because of huge snow drifts residents of Park Point in Duluth could not cross the Lift Bridge until March 7th. March 4, 2000 was the warmest in state history as over 60 communities reported afternoon high temperatures of 60F or greater. The temperature hit 70F at Luverne (Rock County) tying an all-time state record. The abnormal warm spell last until the 8th, then the other shoe dropped with a snow storm over March 8-9 that left a few inches of snow and dropped temperatures by 30-40 degrees F.
Partly cloudy with warmer than normal temperatures over the weekend. Even warmer early next week, then a chance for showers later on Tuesday and into Wednesday. Continued warmer than normal temperatures through the balance of next week.